Lawn moss is a common problem in areas that receive large amounts of fall rain. 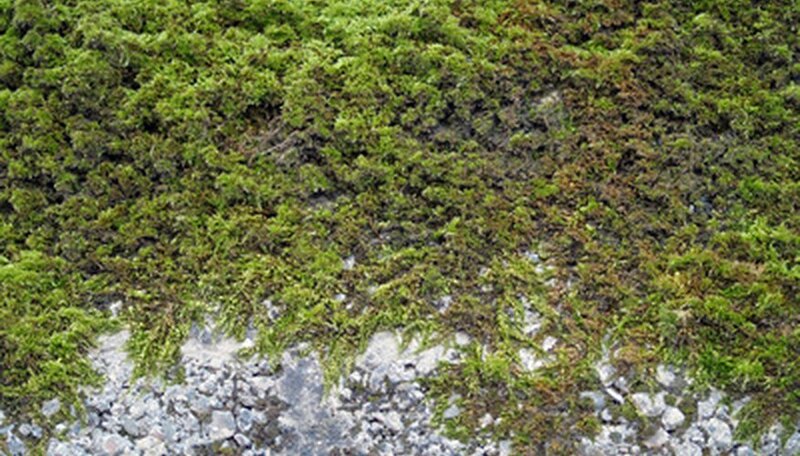 While moss is harmless to the lawn, it does look unattractive and can clash with the color of the grass. There is no quick or permanent fix to lawn moss; rather you must take a systematic approach to remove it from a lawn. Put moss-killing product in a 20-gallon sprayer and spray the moss heavily in early winter while the moss is still dormant. Moss killer will not harm any other plants, however it will stain the soil, so avoid over-applying. Rake the dead moss out of the dormant grass in late winter. Be careful to avoid spreading the mosses' spores around the yard, as the spores will root and form new moss. The best way to prevent the spores from spreading is to rake and bag as you go through the yard instead of raking the moss into piles. Seed the area by spreading a thin layer of gardening soil and some grass seeds in mid spring. The new grass will grow above the moss and prevent the moss from obtaining sunlight. Dethatch the grass with a dethatcher in late spring or early summer. Dethatchers are known to remove up to 75% of moss. Fertilize your lawn every spring and fall using 2 lbs. of nitrogen for every 1000 square feet of grass. This will ensure that the grass is healthy and full enough to crowd out any areas where moss may grow. Water your lawn regularly so that it is thick. A thick lawn chokes out moss. "The Lawn Bible: How to Keep it Green, Groomed, and Growing Every Season of the Year"; David R. Mellor; 2003.